Virginia Tech assistant professor Xiaoyu Zheng and his team have successfully developed a new method to 3D print piezoelectric materials. Piezoelectric materials come in only a few defined shapes and are made of brittle crystal and ceramic. Zheng’s technique on the other hand makes these materials go beyond shape or size. 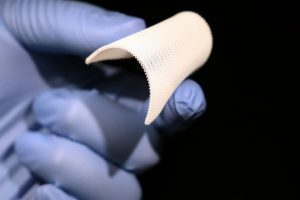 The material can also be activated, leading to next-gen intelligent infrastructures and smart materials for tactile sensing, impact and vibration monitoring, energy harvesting, and other applications. The new model allows the researchers to manipulate and design arbitrary piezoelectric constants, resulting in the material generating electric charge movement in response to incoming forces and vibrations from any direction. And unlike conventional piezoelectrics where electric charge movements are prescribed by the intrinsic crystals, the new method allows users to prescribe and program voltage responses to be magnified, reversed or suppressed in any direction. Current piezoelectric fabrication techniques depend on the natural crystal used. The orientation of atoms are fixed at the atomic level. Zheng’s team has successfully produced a substitute that mimics the crystal but allows for the lattice orientation to be altered by design. “We have synthesized a class of highly sensitive piezoelectric inks that can be sculpted into complex three-dimensional features with ultraviolet light,” says Zheng. According to the researchers, the material has sensitivities 5-fold higher than flexible piezoelectric polymers. The stiffness and shape of the material can be tuned and produced as a thin sheet resembling a strip of gauze, or as a stiff block. Zheng sees the technology making a leap into robotics, energy harvesting, tactile sensing and intelligent infrastructure which are made entirely from piezoelectric material.